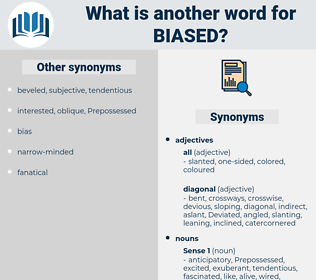 What is another word for biased? Discriminated, imbalanced, mistaken, unjustified, Influenced, polarised, preferred, reconsidered, unfavourable, tarnished, predisposed, Polarized, perceived, advised, bit, positioned, unprejudiced, contaminated, Caught, accused, preconceived, Submitted, Favoured, breached, orientated, undermined, instructed, Lacked, Avoided, failed, Shifted, tainted, considered, Aimed, Channelled, slanted, Defaulted, vitiated, tailored, Steered, detached, Targeted, skewed, aligned, shaped, wasted, deprived, missed, disposed, Indicted, authored, tilted, pointed, stacked, framed, adopted, inclined, Warned, written, confounded, guided, Leaned, oriented, limited, driven, contacted, Prevented, directed, Averted, Drafted, Notified, centred, marred, handed, Referred, colored, geared, focused, focussed, marked, forged, reneged, taken, unbiased, party, clouded, gone, Worded, Looked, Told, distorted, unbalanced. skewed, prejudiced, partial, partisan, tendentious, impartial. apathetic, unemotional, uninterested, distant, unconcerned, honest, detached, incurious, persuasible, hardheaded, independent, reasonable, remote, autonomous, impersonal, aloof, unenthusiastic, just, bipartisan, cold, uncurious. She had been biased towards this suspicion by the fact that the man, when he first referred to Sapps Court, had spoken the name as though sure of it; and it was to test its validity that she invited Aunt Elizabeth Jane round by the private door, and introduced her to the darkened bar, where the ex - convict was lighting another pipe.